While the broadcast world has high hopes for ultra-high-definition (UHD), it presents a number of problems, according to UK firm Futuresource Consulting — not least the need for compatible hardware and much higher data transmission rates. The difficulties involved in producing 4K panels (so-called because they offer four times the resolution of 1080p) at high yield rates are many, which in turn will probably keep prices out of the reach of most people for several years yet, says the report. 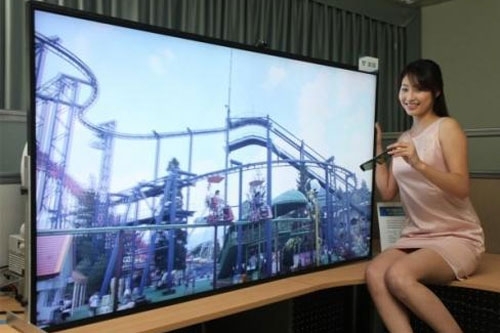 However, the major Asian manufacturers (such as Samsung and LG) are moving ahead with the production of large screen 4K TVs, and most major brands are likely to launch models over the next 12 months, thus representing a critical period in the development cycle of 4K. The broadcast industry also faces a separate challenge: securing enough bandwidth to transmit 4K. Futuresource believes that as motion-blur is more visible at higher resolution, the frame rate should ideally be doubled to counter this, meaning that the uncompressed data rate will become eight times that of 1080p. «Clearly this has implications for the compression industry and while the new High Efficiency Video Codec, HEVC, is due to be ratified in January, hardware based, real-time encoding required for live transmission is realistically at least two years away,» concludes the report. A separate study issued last month by IHS predicted that consumer demand for 4K televisions will remain negligible for the foreseeable future, with shipments never accounting for more than 1 percent of the global LCD TV market during the next five years. The Consumer Electronics Association (CEA) recently ratified a proposal to allow manufacturers to officially brand 4K televisions as ‘Ultra High-Definition’ in the US, just in time for the holiday season.